This name uses Spanish naming customs: the first or paternal family name is Figueroa and the second or maternal family name is Róchez. Maynor Alexis Figueroa Róchez (born 2 May 1983) is a Honduran professional footballer who plays as a centre back or left back for Houston Dynamo in MLS. He currently plays for the Honduras national football team, where he serves as captain. He spent most of his career at Wigan Athletic, where he made 179 Premier League appearances and won the 2013 FA Cup. Figueroa has made over 100 international appearances since 2003, including at three CONCACAF Gold Cups, two FIFA World Cups and the 2012 Olympics. Born in Jutiapa, Atlántida, Figueroa started his career with Victoria, before moving to Olimpia in 2003. He later became club captain. In 2007, Figueroa received offers from Major League Soccer clubs, one of which was revealed to be New England Revolution, but Olimpia's administrator, Osman Madrid, turned down all the offers. Figueroa had drawn previous interest from foreign clubs aside from those in MLS, including Club Toluca of Mexico making offers during 2007. However, during an interview, Madrid indicated the terms sought by other teams had been neither agreeable nor economically favourable to Olimpia or Figueroa. On 20 December 2007, Honduran newspaper El Heraldo reported that, as a result of interest expressed by the Premier League club Wigan Athletic, Figueroa would be travelling to England. In January 2008, Figueroa joined Wigan on loan for the rest of the 2007–08 season. In July 2008, after a complicated process involving work permit and visa issues, Figueroa rejoined Wigan on loan for a further six months, after which Wigan had the option to make the deal permanent following a successful loan spell. On 23 December 2008, Wigan announced Figueroa had signed a three-and-a-half-year contract to join permanently. He scored his first goal for Wigan on 11 January 2009. He scored a close range header to secure a late winner against Tottenham Hotspur. On 12 December 2009, Figueroa scored a goal against Stoke City from his own half to put Wigan in the lead. Figueroa noticed Stoke goalkeeper Thomas Sørensen off his line at a free kick and struck the ball quickly to send the ball soaring over Sørensen and into the net. Although the match ended 2–2, Figueroa made the headlines the following day, with Alan Hansen calling it a candidate for Goal of the Season. Indeed, Figueroa's goal was chosen as Match of the Day's Goal of the Season for 2009–10. By the end of the 2009–10 campaign, he had made 81 appearances and scored twice in all competitions for Wigan. The 2010–11 campaign proved difficult for Wigan and Figueroa. On 26 February 2011, he made his 100th Premier League appearance, playing the full 90 minutes at left-back in a 4–0 defeat against Manchester United at the DW Stadium. He scored a goal against fellow relegation struggling side Birmingham City on 19 March 2011 that led to a 2–1 win for Wigan. On the last day of the season, Wigan needed to win and have results go their way in order to secure Premier League safety. Figueroa provided the breakthrough for the away side in the 78th minute, setting up Hugo Rodallega to win the game 1–0 at Stoke City and confirm Wigan's safety in the Premier League. During Wigan's first League Cup game of the 2012–13 season, Figueroa scored from 35 yards out, as Wigan defeated Nottingham Forest 4–1 at the City Ground. Wigan achieved success in the FA Cup winning the competition after beating Manchester City 1-0 in the final. Figueroa had played in every round of the FA Cup but was injured for the FA Cup final; however he did receive an FA Cup Winner's medal  However, they did not have as much success in the Premier League and were relegated at the end of the season. Newly promoted Premier League side Hull City announced the signing of Figueroa on a free transfer on 17 June 2013. He made his debut on the first day of the 2013–14 season in a 2–0 loss away at Chelsea. Figueroa reached an FA Cup Final for the second successive season after playing in every game prior to the final. Whereas he missed the 2013 FA Cup Final Final through injury, he was an unused substitute for the 2014 FA Cup Final after manager Steve Bruce changed the system to 5-3-2 with the manager's son Alex Bruce starting ahead of Figueroa. Hull lost the final 3-2 to Arsenal after extra-time. On 21 October 2014 Figueroa returned to Wigan Athletic on a month-loan and went on to play in the 0–0 draw against Millwall the same day. After five consecutive games for the club since joining on loan, Wigan extended his loan deal until 30 December 2014. He was recalled to Hull on 22 December 2014, along with Tom Ince from Nottingham Forest. On 28 May 2015, Figueroa was one of six players released by Hull manager Steve Bruce. Following his release by Hull City, Figueroa joined MLS team Colorado Rapids on 7 August 2015. He made his MLS debut on 21 October 2015 in a 2–0 victory over Sporting Kansas City. On 26 January 2016, Figueroa was traded to FC Dallas. He made his league debut for FC Dallas on 6 March 2016 in a 2–0 win over the Philadelphia Union. In his first season in Dallas, the club won the U.S. Open Cup and the Supporters' Shield. Figueroa was released by FC Dallas the end of their 2018 season. He joined rivals Houston Dynamo on 30 January 2019. 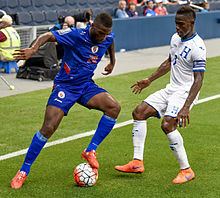 Duckens Nazon of Haiti against Figueroa in the Gold Cup, Sporting Park, Kansas City, Kansas, 13 July 2015. Figueroa made his debut for Honduras in 2003 and has since gone on to score goals against Belize, Cuba, Jamaica, the United States and Australia. He was part of the Honduras squad at the 2005, 2007, 2011 (did not appear) and 2015 CONCACAF Gold Cups. He was also named in the 23-man squad for the 2010 FIFA World Cup in South Africa. Figueroa played out of position as a centre back at the World Cup, due to the form of Emilio Izaguirre. He was again named to Honduras' squad for the 2014 World Cup. Figueroa also represented Honduras at U-20 and U-23 level from 1999 to 2003 and 2001 to 2003 respectively, scoring once in three games for the U-20s and failing to score in eight outings with the U-23 side. He joined the U-23 squad as an overage player for the 2012 Summer Olympics. He has won a total of 149 caps, the most for Honduras, scoring five goals since his debut back in 2003. He is currently the national team captain. Figueroa is married to Sandra Norales, a handball player who represents Honduras in that sport. As of 3 March 2017. ^ a b c "Figueroa". FootballDatabase. Retrieved 14 December 2009. ^ "Player Profile". Premier League. Retrieved 18 March 2011. ^ "Wigan swoop for defender Figueroa". BBC Sport. 17 January 2008. Retrieved 31 January 2009. ^ "It Fig-ures". Wigan Athletic F.C. 29 July 2008. Archived from the original on 19 September 2008. Retrieved 31 January 2009. ^ "Figueroa wraps up move to Wigan". BBC Sport. 23 December 2008. Retrieved 31 January 2009. ^ Hughes, Ian (11 January 2009). "Wigan 1–0 Tottenham". BBC Sport. Retrieved 26 October 2009. ^ Percy, John (14 December 2009). "Maynor Figueroa halfway to Wigan paradise". The Times. London. Retrieved 14 December 2009. ^ Fletcher, Paul (12 December 2009). "Stoke 2–2 Wigan". BBC Sport. Retrieved 13 December 2009. ^ "Wigan Athletic vs. Birmingham City - Football Match Report - March 19, 2011 - ESPN". ESPN.com. Retrieved 7 June 2018. ^ "Hugo Rodallega keeps Wigan in top flight with goal against Stoke City". The Guardian. 22 May 2011. ^ "Tigers Sign Figueroa". hullcityafc.net. Hull City AFC. 17 June 2013. Archived from the original on 19 June 2013. Retrieved 17 June 2013. 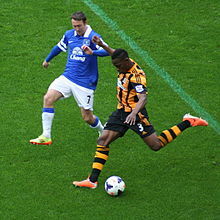 ^ "Maynor Figueroa: Hull defender in Wigan loan return". BBC Sport. BBC. 21 October 2014. Retrieved 21 October 2014. ^ "Wigan 0 0 Millwall". BBC Sport. BBC. 21 October 2014. Retrieved 21 October 2014. ^ "Maynor Figueroa: Wigan extend Hull defender's loan deal". BBC Sport. BBC. 6 November 2014. Retrieved 22 November 2014. ^ "Hull City: Paul McShane and Steve Harper among six released". BBC Sport. 28 May 2015. Retrieved 28 May 2015. ^ "Rapids sign experienced defender Maynor Figueroa". Colorado Rapids. 7 August 2015. Retrieved 27 October 2015. ^ "Sporting KC vs. Colorado Rapids - 22 October 2015 - Soccerway". us.soccerway.com. Retrieved 7 June 2018. ^ "FC Dallas acquires Honduran defender Maynor Figueroa from Colorado Rapids in exchange for General Allocation Money". FCDallas.com. 26 January 2016. Retrieved 26 January 2016. ^ "Dallas vs. Philadelphia Union - 6 March 2016 - Soccerway". us.soccerway.com. Retrieved 7 June 2018. ^ "Honduras: World Cup 2010 team guide". The Guardian. 5 June 2010. Retrieved 17 April 2011. ^ "Maynor Figueroa". Soccerbase. Retrieved 7 June 2014. ^ "Games played by Maynor Figueroa in 2007/2008". Soccerbase. Centurycomm. Retrieved 7 June 2014. ^ "Games played by Maynor Figueroa in 2008/2009". Soccerbase. Centurycomm. Retrieved 7 June 2014. ^ "Games played by Maynor Figueroa in 2009/2010". Soccerbase. Centurycomm. Retrieved 7 June 2014. ^ "Games played by Maynor Figueroa in 2010/2011". Soccerbase. Centurycomm. Retrieved 7 June 2014. ^ "Games played by Maynor Figueroa in 2011/2012". Soccerbase. Centurycomm. Retrieved 7 June 2014. ^ "Games played by Maynor Figueroa in 2012/2013". Soccerbase. Centurycomm. Retrieved 7 June 2014. ^ "Games played by Maynor Figueroa in 2013/2014". Soccerbase. Centurycomm. Retrieved 7 June 2014. ^ "Games played by Maynor Figueroa in 2014/2015". Soccerbase. Centurycomm. Retrieved 21 August 2014. ^ "M. Figueroa". Soccerway. Retrieved 22 November 2016. ^ "M. Figueroa". Soccerway. Retrieved 28 May 2015. Wikimedia Commons has media related to Maynor Figueroa.